The Chi’s setting may have struck a chord with the Chicago-based A.V. Club, but early glimpses indicated the show had something to offer viewers everywhere, including an exceptional cast led by Mudbound’s Jason Mitchell, and innovative directors like Rick Famuyiwa, who helmed the pilot. Then there was creator Lena Waithe’s compelling vision for the show, which called for authentic storytelling and rich characterization in an underseen community on Chicago’s South Side, all set within an increasingly high-stakes drama. An early decision by Waithe to focus on building the humanity of the show’s black male characters as a response to the violent treatment their real-life counterparts receive has created a demonstrable void in the storytelling, something resident Chi reviewer (and South Side native) Ashley Ray-Harris has noted in her astute coverage. And I agree that so far, The Chi has underserved its women, especially Jerrika (Tiffany Boone) and Laverne (Sonja Sohn), who orbit Brandon (Mitchell), their husband and son, respectively. Even characters like Ronnie (Ntare Guma Mbaho Mwine), a not-so-reformed O.G., end up behaving rather unaccountably despite extensive screen time. But at the midseason point, The Chi appears to be turning things around. 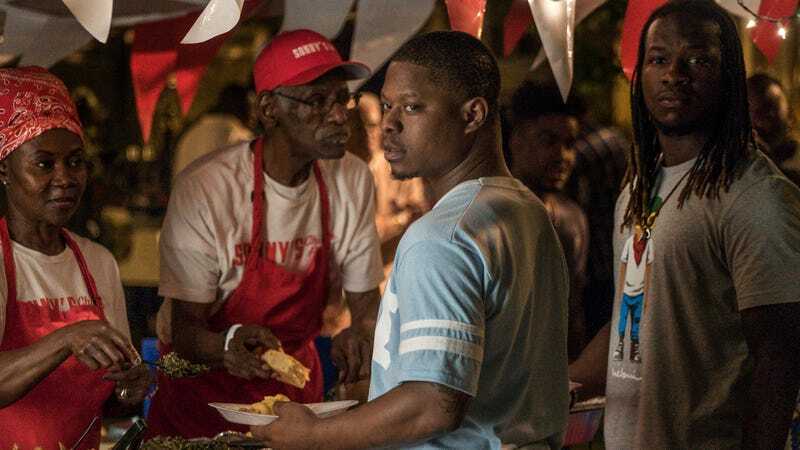 In “Today Was A Good Day,” just as the residents defiantly continue their long-awaited block party despite the sound of gunshots, the show sticks to its slice-of-life portraiture instead of further exploring criminal enterprises, which yields the best episode so far. The peace is only temporary, of course, but for many, it’s a much-needed respite from the increasingly tangled web of hustlers, would-be kingpins, and corrupt cops. I say “for many” because I haven’t found what we’ve seen so far to be quite as haphazardly plotted. The show definitely has a surplus of characters, but Waithe and her writers, including Ayanna Floyd, Marcus Gardley, and Justin Hillian, have been more thoughtful in their inclusion than it might appear. Take Detective Cruz (Armando Riesco), the homicide cop who, in the pilot, interrogates young Coogie (Jahking Guillory) about the shooting death of Jason (Lucien Cambric), a star athlete from the neighborhood. The quick-witted teen gets the better of him in their interaction, something that’s not lost on the Cuban-American cop. In fact, he’s so impressed that he goes out to buy a pair of Timberlands on Coogie’s recommendation. The revelation of the purchase turns bittersweet as we see Cruz cross a field in those Timbs to find Coogie’s dead body. In this and other moments, like when he tells Ronnie about the shooting death of his adopted son, Cruz comes across as “one of the good ones”—an outsider, yes, but one who doesn’t pose the same threat as his brothers in blue or fellow gentrifiers. Cruz is white-presenting but not necessarily white-passing; he takes fashion advice from black teens; most importantly, he cares enough about the people in his precinct to actually investigate their murders. He curses in Spanish when a white detective (Brian King) dismisses everything going on in the South Side as “gang activity,” whether its a murder or a block party calling for an end to gun violence. But as Cruz’s story’s progressed, it’s become clear that “one of the good ones” is mostly a self-affixed label. He doesn’t think he’s the same kind of cop King’s character is; he feels he’s “played fair” with any suspects he’s investigated, as well as his criminal informants like Ronnie. So when Cruz barges into Ethel’s (LaDonna Tittle) home looking for Ronnie in “Quaking Grass,” he does so in part because he feels played by his former CI, who he’s starting to believe may have killed Coogie, but also because he’s genuinely worried. So he feels within his rights to force his way into Ethel’s home and even intimidate her until she pulls a shotgun on him, at which point he shows disbelief at her response: How could she threaten him when he’s so clearly one of the good ones? In scenes like these, The Chi explores the many connotations of this alternately comforting and condescending term. Historically, “one of the good ones” (see also: “a credit to your race”) has been used to single out a marginalized person who defies expectations in some way, whether it’s by staying in school or suffering in silence while being oppressed. For people in power, “one of the good ones” is someone who doesn’t cause trouble, won’t make you uncomfortable, and isn’t going to require you to repeat yourself or use excessive force. As genial as his first exchange is with Coogie, it’s obvious that Cruz has decided the teen is a “good kid,” though maybe not quite as impressive as Jason, whose murder kicks off the action this season. While remaining oblivious to how paternalistic he’s being, Cruz demonstrates just how much harm one of the good ones can do, making tragic mistake after tragic mistake. Now, it’s absolutely fair for viewers to still feel that precious story and time are being wasted on someone who looks and acts the part of the white savior, but I don’t think that’s where The Chi is going with Cruz. As frustrating as it might be to see him on screen, he’s a key piece of the mosaic Waithe and her fellow EPs are piecing together. His presence is symbolic of the predominantly Latinx neighborhoods that have, intentionally or not, served as buffers between white and black communities, as well as of the violence that non-black people of color can perpetrate in official capacities. His emissary storyline is another intentional move on Waithe’s part, one that we shouldn’t write off just yet. Will The Chi be the first series to do Chicago right?